Leaving manufacturing and quality control to others is a risky strategy. Any test subcontractor can choose to avoid a late delivery by short cutting a manufacturing procedure. Such production exceptions become invisible in data files and analysis systems that cannot reveal what is happening during the empty spaces between tested units. Complete visibility of the production process is enabled by Invantest cell controllers that continuously "watch" and record all activities, events, and results at every test cell at all times without fail. This visibility is available to engineers at fabless companies in a Production Dashboard available at their desktop computer, laptop, or touch-screen tablet and coming soon to smart phones. While engineers sleep, Invantest floor and cell controllers maintain the integrity of the test process at every test cell and guarantee that all manufacturing and process steps are performed correctly and in the correct sequence without exception. For a fabless company, Invantest systems provide peace of mind that manufacturing proceeds as required for their customers at maximum efficiency. For their test subcontractors, Invantest systems enable execution of flawless, best-in-class test services to earn more fabless business. Fabless companies are handicapped by having semiconductor manufacturing sites many thousands of miles away controlled and regulated by another company. To eliminate this handicap, Invantest's Virtual Test Floor brings the test into the offices of authorized employees. This virtual experience is better than the physical experience. Users enter the test floor through the ceiling with a view of all the test cells testing their products. By moving a cursor onto a test cell or touching it on a tablet, the user sees the current state of the equipment with the latest production results; selecting the test cell reveals its historical performance. With Invantest cell controllers running at each test cell, a fabless company can monitor production testing of its products in near real time at all its manufacturing sites. The definition of near real-time depends on the medium for information transfer allowed by the subcontractor, but it is not difficult to find examples of rapid information updates from remote servers that showcase what is possible. 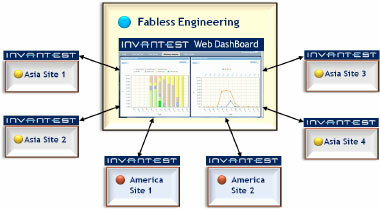 Invantest's Production Dashboard consolidates results from all test sites for easy comparisons. Information in the Production Dashboard is decision ready. When historical analysis is required to make a decision, it can be summoned up with a click of a mouse or a touch on a screen. Invantest information flows are standard and reliable across all test cells to avoid having to struggle with the data differences and inconsistencies from different test houses, equipment, and data formats. Using a Navigator Floor Controller, a fabless company can predefine all the vital manufacturing and control parameters for a product in a device profile and equipment setup prior to releasing it into production. The device profile can then be transferred with the test program to every test house to guarantee that manufacturing proceeds exactly as specified for each device. The feedback signals are manufacturing device profiles in a Navigator Floor Controller. Device profiles are auto loaded into Invantest cell controllers at the start of each lot to identify exceptions and out-of-control variations during semiconductor testing. This information is automatically fed back into a Production Dashboard for tuning of production parameters to stabilize the system within progressively tighter control limits.